I have warned that 2017 will be the political year from hell. 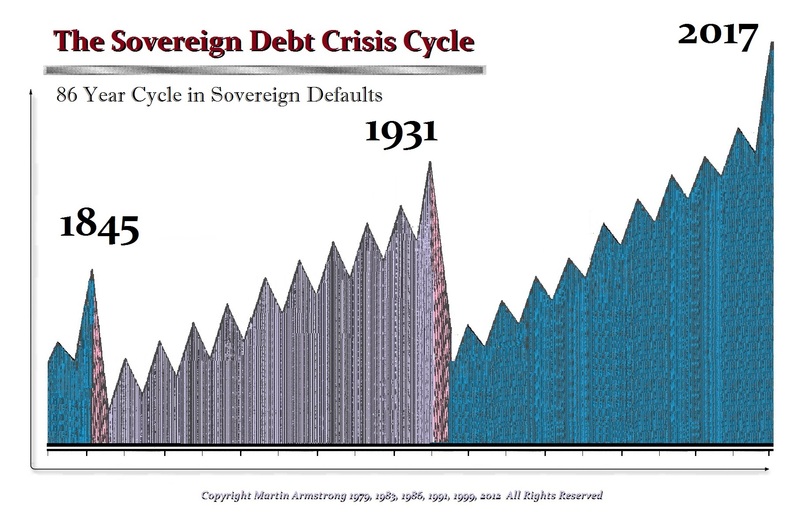 What I am illustrating here is the link between a sovereign debt crisis and the Revolutionary Cycle. In 1933, Roosevelt came to power in the USA and turned the country toward socialism. That same year, 1933, brought Hitler and Mao to power. So 1934 was the revolutionary year. Such revolutions do not always bring blood in the streets. The next one is due in 2020 and we should see the system we currently live under go completely upside-down. The revolutions of 1848 were essentially a democratic movement and an uprising against the political elite. In 1848, Karl Marx published “The Communist Manifesto” with Friedrich Engels, and was exiled to London as a result. In London, where he lived the remainder of his life, he wrote the first volume of “Das Kapital”. This undoubtedly influenced the revolutions that opened the door to communism/socialism. This also inspired the collapse of the old feudal structures and created independent national states. The revolutionary wave began in France in February 1848 when the French monarchy was overthrown. Communism actually began in France as a “commune” where people lived in one shared community with no individual property rights. It was the French who convinced Marx that communism would work better than just socialism, which he had advocated initially. This 1848 revolution spread as a contagion, similar to what the American Revolution had done during the previous century. The contagion of 1848 spread to most of Europe and parts of Latin America. In total, it impacted over 50 countries. This was by no means a coordination or cooperation between various revolutionary trends around Europe. Generally, a contagion is attributed to six factors: (1) widespread dissatisfaction with political leadership, as we have today; (2) demands for more participation in government and democracy, as republics have once again robbed us of our right to vote; (3) demands for freedom of press, which is manifesting today in the internet; (4) the demands of the working class, whom today have been oppressed by huge tax rates combined with income taxes and VAT at 20%+; (5) the upsurge of nationalism, which we are again watching unfold thanks to terrorism; and finally, (6) the regrouping of the reactionary forces based on the royalty, aristocracy, army, church and peasants, which is again unfolding as class warfare. The American Revolution really began in 1762 or 86 years before 1848. Indeed, the very same issue that sparked the American Revolution was the government’s practice of arbitrarily seizing assets and searching letters to see if anyone spoke anything derogatory against the government. The NSA today does exactly what the king’s men had done. In 2014 and 2015, the assets confiscated by police exceeded all the property stolen by criminals. The police have replaced the criminals in so many ways. They get to seize property and are rarely ever held accountable for killing citizens rashly. They always use deadly force rather than resolving issues without killing someone in the process. These very same practices came to a head in the famous trial involving writs of assistance to the revenue officers, empowering them, at their SOLE discretion, to search suspected places at will. This eventually became the reason for the American Revolution and is what became known as the Fourth Amendment in the USA, which judges have swept away under the rug and no longer exists. The legal case which became the seminal beginning was Entick v. Carrington and Three Other King’s Messengers, reported at length in 19 Howell’s State Trials 1029. The action, dated November 1762, was for trespassing and interfering with the plaintiff’s dwelling by breaking open his desks and boxes and searching and examining his papers. This is what cycles are about. Fourteen years after 1762 marked the American Revolution in 1776 with the Declaration of Independence. After nearly one Pi Cycle (31.4 years from Otis’ speech) George Washington was sworn into presidency and the United States was born. It is always just a question of time. Society moves within a continuum with a sense of perpetual continuous motion. I have stated this before, but it needs to be repeated. Focusing upon the personality of Hitler or Napoleon misses the entire point. It is NEVER the individual who moves the majority; it is the majority that produces the individual. Hitler was imprisoned for what he considered to be “political crimes” following his failed Putsch in Munich in November 1923. While imprisoned, Hitler wrote “Mein Kampf” (“My Struggle”). Dictating the book to Rudolf Hess, Hitler outlined his political ideology and future plans for Germany. Volume 1 was published in 1925 and Volume 2 in 1926. However, he came to power in 1933 or about 8.6 years after publication. Society creates the leader, not the other way around. If we focus upon the economy, this turns the heat up for political change. Which individual takes the lead is not the important issue. Society will ALWAYS select someone. An individual cannot force their ideas upon society no matter how loud they scream. Therefore, societal history is indeed following physics like everything else. A body in motion will stay in motion until there is some resistance to slow it down. Government’s mismanagement grows larger and reduces economic growth to the point where we have tax rebellions that often result in revolution. 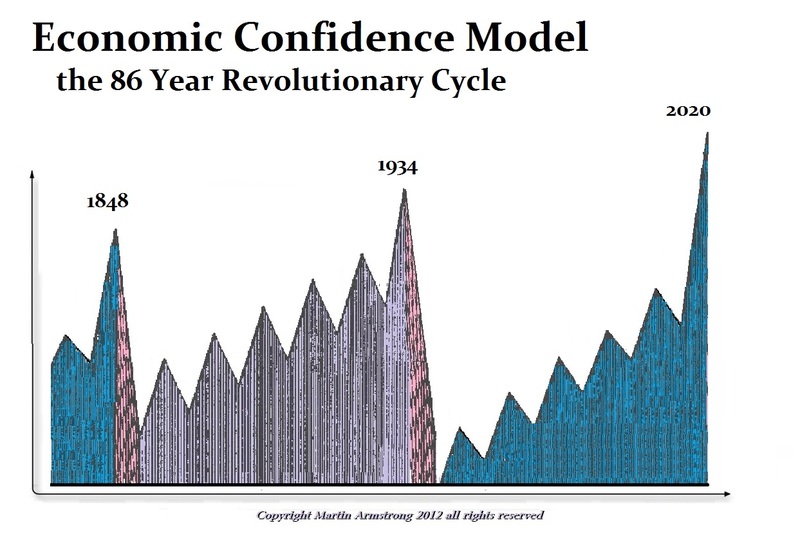 History is, in fact, modeled by a deterministic, non-linear, dynamic system that displays chaotic behavior (Panic Cycles). Mapping the small changes within such a system that ripple through the entire mass is fascinating, for such changes are never seen by the actor as impacting a far more dynamic system. FATCA, for example, is directly reversing the global economic expansion by forcing Americans back into a domestic economic environment that is worsening the deflation external to the USA as the dollar is forced higher. The outflow of capital from the USA reconstructed the world economy, whereas now that single tax-hungry law set in motion the reverse consequence of destroying the world economy. Therefore, in a mathematical sense, the slightest deviation to the global economic system will eventually create a wildly divergent outcome. This act is inspired by the fact that government is incapable of managing itself, no less the economy that they do not even comprehend. Therefore, it is not that one man can make a difference. I tried that route and quickly saw that the best ideas were still ignored due to the self-interest of those in charge. Consequently, it is NEVER the individual, but society, that must reach the point where it seeks an answer and embraces a new idea. 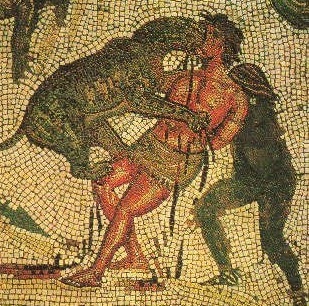 Rome collapsed during the 3rd century; this is when the Christian Persecution really surged. Some argued the gods were angry because there were too many Christians and this is why they did not respond to the prayers of the Romans. Eventually, more and more people took the opposite view that their prayers were not answered because they were false gods. Christianity took off and Constantine plundered the pagan temples, pronouncing Christianity as the new religion so he could confiscate that wealth and restart the empire by moving the capital to a brand new city — Constantinople (Istanbul today). Rome collapsed during the 3rd century; this is when the Christian persecution really surged. Some argued the gods were angry because there were too many Christians and this is why they did not respond to the prayers of the Romans. Eventually, more and more people took the opposite view that their prayers were not answered because they were praying to false gods. Christianity took off and Constantine plundered the pagan temples, pronouncing Christianity as the new religion so he could confiscate that wealth and restart the empire by moving the capital to a brand new city — Constantinople (Istanbul today). Therefore, history repeats because humanity never changes. What drives it is the majority swinging back and forth much like Republican vs. Democrat political victories. History is not made by the ideas of individuals; the individuals are produced as a response to the shift in the flow of history that behaves in a continuous manner by responding in the same manner to forces no matter what century we look at. Once we abandon the deep analysis of people like Hitler and step back from the individual to observe the collective community, suddenly history takes shape, which conforms, like everything else, to the laws of physics. So yes, we will see a European revolution. It is inevitable.